Check out the latest Trade As One on My Subscription Addiction! 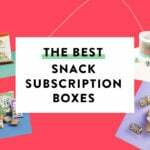 Trade As One Subscription Box Review & $30 Off Coupon Code! "I got the the juice beauty offer too, but I will wait to sign up in June. I love the June spoilers!" "oooh this sounds lovely! I really do like that green color. I am always really minimal with eyeshadows but I nee..."
"You are welcome! It def looked much more true orange in the tube. I am glad the eyeshadows were a hit for you gu..."